I’ve been channeling my mother. Let me hasten to add that she has not gone over to the other side. She’s alive and well and doing some renovations. I’m channeling an earlier incarnation of my mother, the one in her 20s and 30s, the one that used to lay out yards of fabric and, with a pair of giant, sharp, impressive scissors, would cut and cut and cut. “I want to go cut cut cut like thaaaat!” I apparently whined at a young age. I wanted to get my hand on the scissors. I watched as well-dressed, sometimes perfumed, ladies came to the house and Mum got down on her supple knees to do their hems. And then there’d be the staccato runs of her green Singer sewing machine. 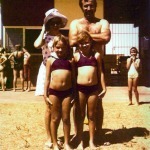 Mum, Dad, Deb and me at the Carnarvon pool, c. mid ’70s. 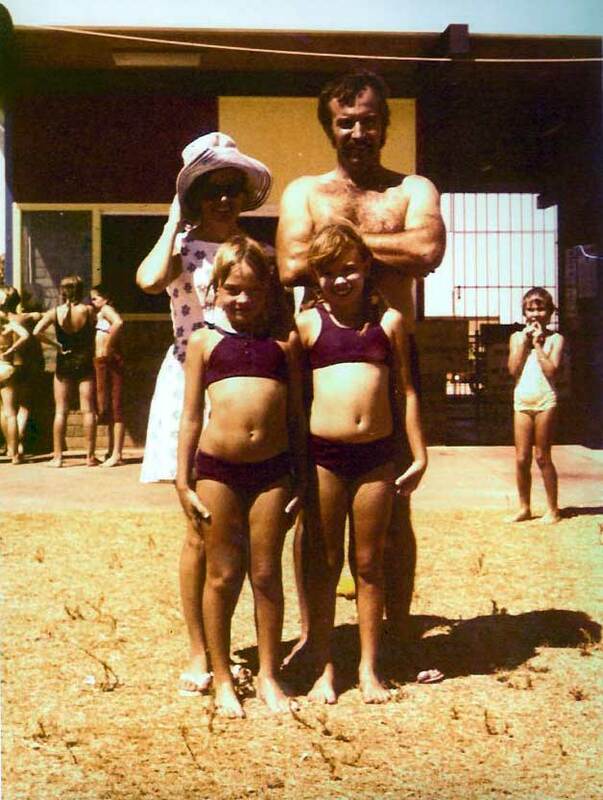 By the late ’70s she’d switched from ladies’ frocks to curtain contracts to earn a living. Nice straight lines. A lot easier, and more lucrative, than shaping fabric to women’s bodies. Now I’ve got my own hands on the scissors. I’ve made a calico toile for a set of three turquoise fifties dresses with big gathered skirts. We’ll be coming on stage in our lovely frocks, only to disrobe to our taupe “undies”, in which we will do some physical jerks while someone else reads out our True Confessions. As I whined last week, this is outrageous behavior for me, especially the physical jerks. But I think I may be on top of skipping backwards. As long as I don’t think about it too much. 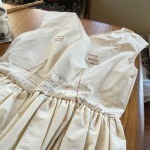 But making the dresses … that’s beautifully familiar. 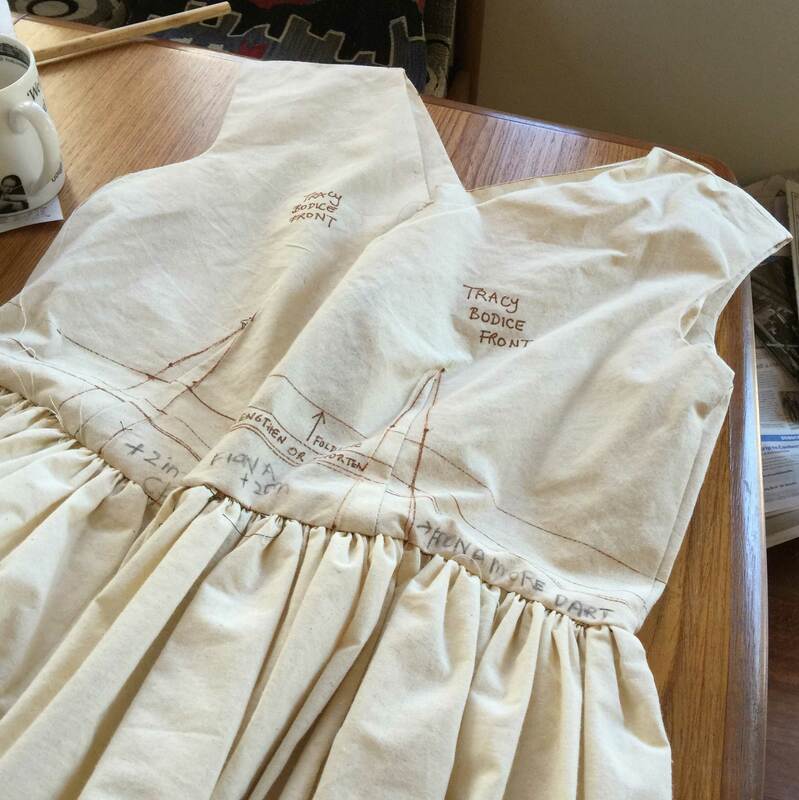 The movements of scissors, fabric, machine, pulling gathers – they’re all body memories. Apparently when you watch something, the same parts of the brain are triggered as if you do the actions yourself. 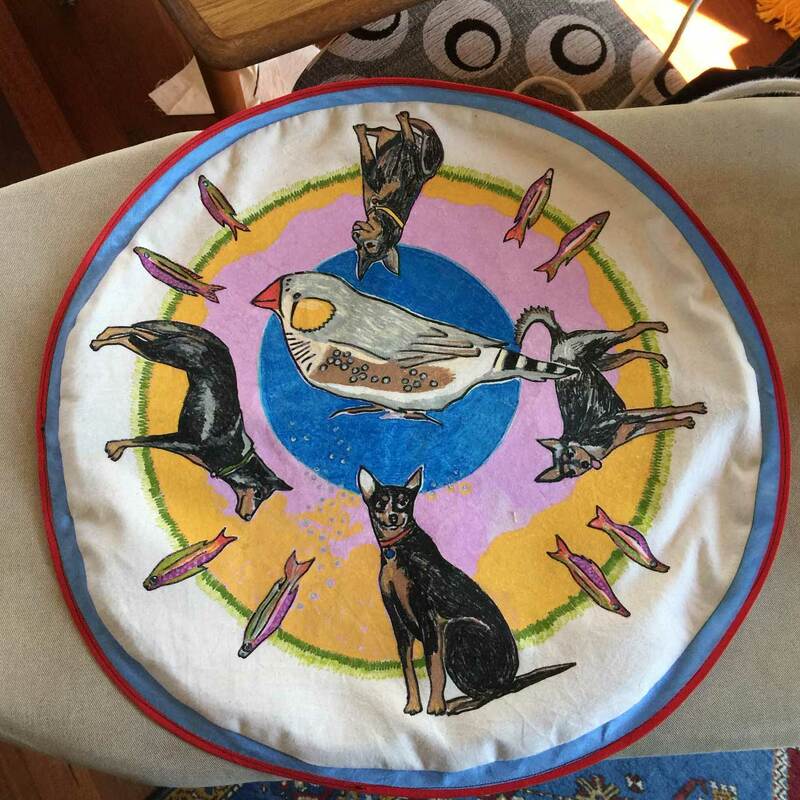 As I sew, I channel my mother’s movements. Meanwhile, this year’s Waste 2 Art project is ready to ship. It just needs to go down the road to the Flannery Centre today at 2pm, and then it just does its own thing. I’ve finished fiddling with it. It’s in its cardboard box, waiting to go out of the door. 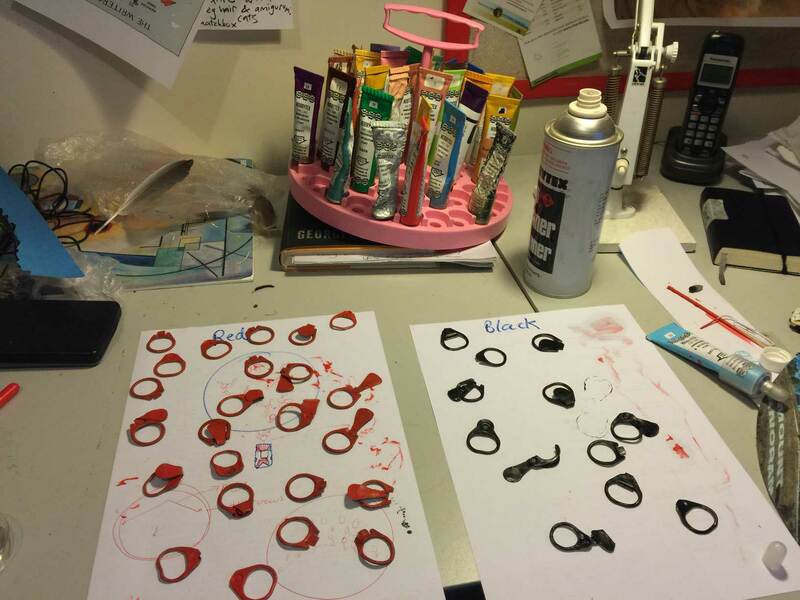 I really enjoyed painting the ring-pulls red and black. The finished piece is a bit of mess, really, but it’s nice to simply participate. The exhibition will be open from May 1-10. Meanwhile, the world goes on being convulsed by trauma; now Nepal. And before that the Kenyan university students. But Bathurst is absolutely gorgeous at this time of year. The trees are yellow and red and orange; there are leaves everywhere. The air is crisp. Media: Recycled items: Found vintage ring pulls; recycled lamp frame; red, black & blue paint from 1970s Hobbytex tubes; lid from old storage canister; found toy car. New item: Beading wire. When you pull back on a ring pull on a can of beer or soft drink, you can hear and see and feel – in the tiny droplets of water – the action of carbon dioxide. It’s the CO2 that makes the fizz. When I walk my black Labrador, Bertie, around McPhillamy Park on the top of Mount Panorama I keep an eye out for ring pulls. I only collect the old-style ones that were discontinued in the 1980s. I like the way their twisted, folded shapes recall the hands that originally tore them from the cans. Delightful moments of fizziness and pleasure are frozen in time in these found ring pulls. 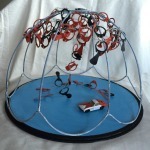 In this piece I have used ring pulls to represent carbon dioxide. It is often represented in three-dimensionally as two red spheres (oxygen) attached to one black sphere (carbon). I painted the ring pulls with Hobbytex paint recovered out of old tubes. (Hobbytex was a fabric-painting craze in the 1970s.) Anyone who has used Hobbytex would have noticed its powerful petrochemical fumes. Carbon dioxide provides more than fizz; it’s an essential part of all life on this planet, and it helps to create the greenhouse effect – a global blanket – that keeps the earth warm enough for the human life we’ve grown accustomed to over the entire course of human development. You can have too much of a good thing. Since the industrial revolution, when we began burning fossil fuels in earnest, the amount of carbon dioxide in the earth’s atmosphere has grown by about 30%. Now, our global blanket is getting a little too warm. I’ve represented this by using the curve of the lamp frame to suggest the curve of the atmospheric blanket over the surface of the earth. I found the metal toy car, encrusted with dirt, in the back yard. 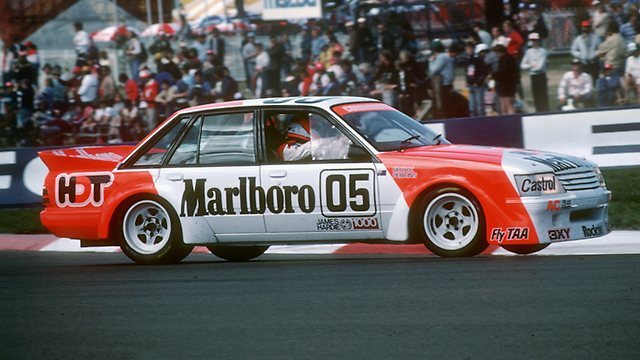 It has been painted in the black and white Marlboro livery of motor racing legend Peter Brock’s cars. Carbon dioxide molecules trail out the back of it like a bride’s long train, and ascend into the overarching atmosphere. Every year at about this time, I think of Simpson and his donkey. I’ve known the story of this courageous pair – how they toiled up and down the cliffs at Gallipoli, taking wounded soldiers to the hospital ships – for as long as I can remember. It’s a fragment of a bigger story that encompasses poppies and mud and the opening scenes of George Johnston’s My Brother Jack, where there were gas masks and crutches in the hall and strangely disfigured men lurking out the back. The earliest Anzac Day ceremonies were personal; they evoked particular young men that people had known and loved. Now, a century later, those young people are more abstract to us. But because of the stories woven round them, they will not be forgotten. What about the young people a hundred years from now? They don’t yet have names or faces. But they’ll be just as real as we are now. And it may be that they will look back at us and wonder how we could have forgotten them. How could we have had so much information about climate change and yet done so little? Perhaps, unlike the Anzacs, they just don’t have a good enough story. 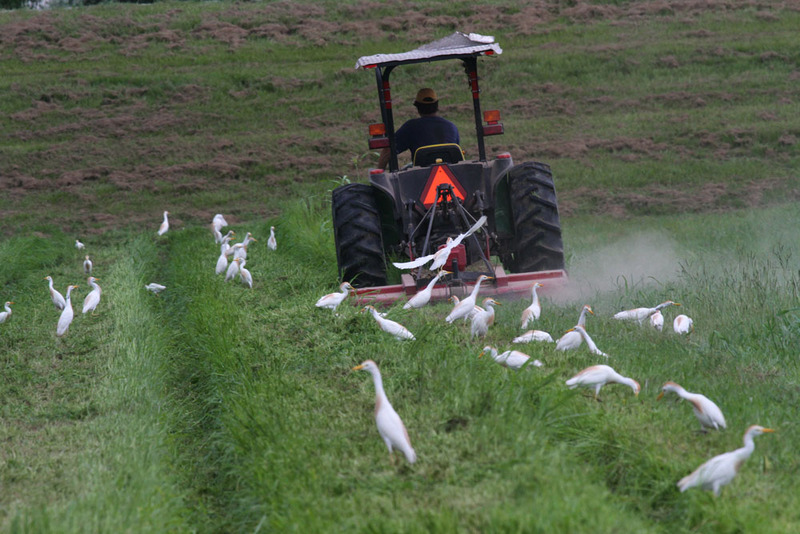 Social scientists tell us that information, by itself, doesn’t make much impact on people. Stories, on the other hand, have sticking power. And the stories we don’t tell each other – the silences – are just as important. Anzac stories can be told simply, powerfully, emotionally. There’s a boy from the bush, running into enemy fire, legs like springs. Climate change offers some scientists writing papers full of maths equations that nobody else can read and a vague sense of guilt about not switching off the power at the wall. For most people, climate change just thuds quietly to the bottom of the brain. But stories are made as much as they’re born. Historian Charles Bean worked tirelessly to promote the memory of the Anzacs at Gallipoli. The Gallipoli story caught on because it combined with the needs of a new nation hungry for stories to tell about itself. A century on, our political leaders are keener than ever to bathe in reflected glory. It certainly beats talking about parts per million of carbon dioxide molecules in the atmosphere. We can know, and yet we can forget. First published in the Western Advocate, April 25, 2015 as a contribution to the Sustainable Bathurst column. 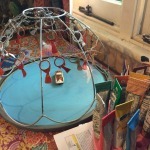 This entry was posted in Bathurst, Bathurst Community Climate Action Network, Bertie, Carnarvon, Craft, family, Hobbytex and tagged Anzac Day, Brian Sorensen, Deb Sorensen, Flannery Centre, Invisible Body, Waste 2 Art, Yvonne Sorensen on April 28, 2015 by Tracy. I’ve just arisen from the sofa, where I had a glorious two-hour nap (2pm to 4pm) all snuggled up in a pudgy doona listening to the rain patter endlessly on the roof. I thoroughly enjoyed this interlude and only feel a little bit guilty about it. It was a bit of mental time out from the great pile of things I should be doing/could be doing. I’m going around with this pile stacked on my head like a woman in Africa carting water or a girl in a grooming and deportment class. It’s nice to sometimes just shake my head, stand to one side and let all those titles (the books of Marking, Reading Serious Things, Writing Serious Things, Organising Stuff) fall to the floor. And step over them and lie down. Besides the doona/sofa combination I do love a bit of craft. Craft is the gift that goes on giving. I have no professional credentials in craft. 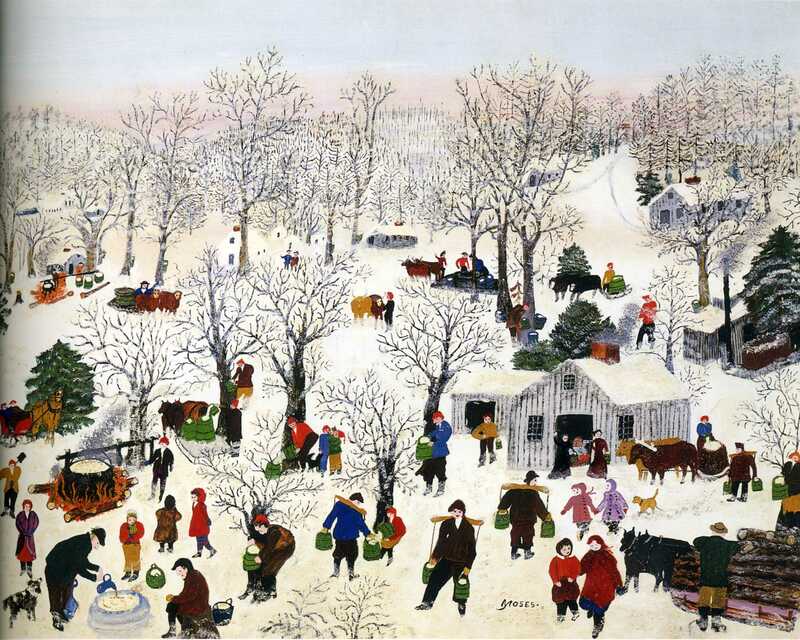 I’m a naive craft artist, like Grandma Moses was a naive painter. I do it the way it’s done in middle childhood. With gusto and lumpiness. 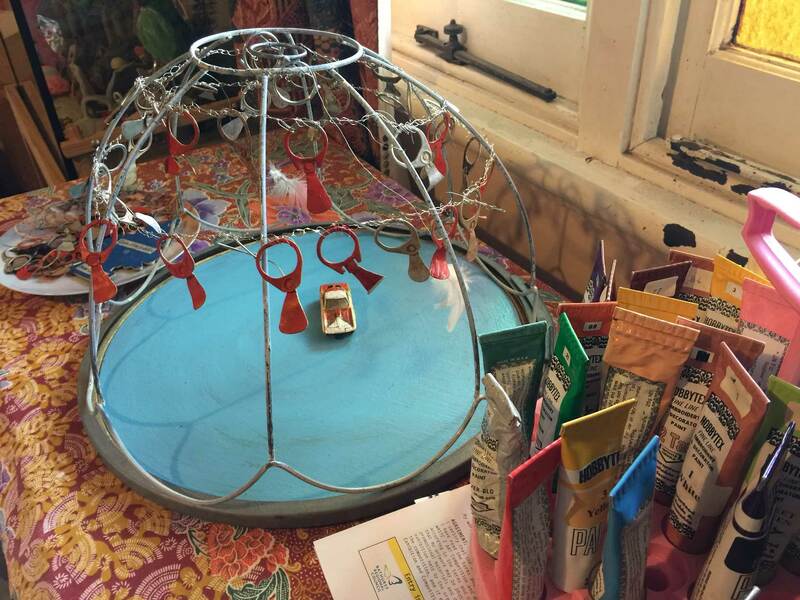 Over the past few days I’ve returned to my 2015 Waste to Art entry (deadline at the end of this month). I’ve had the Hobbytex out to paint my collected vintage ring pulls. 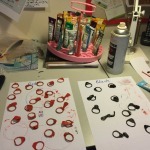 I’m painting two reds to every black to make up my series of carbon dioxide molecules. These are hanging from the framework of an old macrame pendant lamp, bought off eBay a few years ago for the Lost Arts of the 1970s exhibition. I skinned it down to its skeleton, saved the wooden beads and threw away the dusty layers of thick, cream synthetic cord. All those hours of finger-straining work, unraveled, hacked up, dumped in the wheelie bin. Sorry. Hobbytex paint, as some of you may know, is pungent stuff. This is pure petrochemical twentieth century toxin. To revive the almost-hardened paint in vintage tubes, I’ve been twisting off the nibs and dribbling in drops of thinners. Hobbytex thinners are the most extreme thinners imaginable. Virulent. Approach in full body gear. They work beautifully. The paint softens and glistens, forgetting its age, instantly reverting to its pliable, dazzling youth. Hobbytex is so cool, I’m amazed it has never been hipsterised. If the company could just rework itself for a new age – like Tom Jones did, finding a new audience among the children of his original fans – then there might be a way for it to survive. Hobbytex’s soul sister, the paint-by-number phenomenon in the United States, has had something of a revival. And colouring-in for adults is big at the moment. But no. The Hobbytex company appears to be sticking to its stolid dagginess (bless its cotton socks). I fear the day they finally do what I did to the macrame pendant lamp shade. Anyway, I’ve used up a bit of my precious Hobbytex on a found toy car to create an impression of the Marlboro livery of Peter Brock’s famous race winner. It will sit under the dome of the skeletal lamp shade, representing the contribution to greenhouse gases of the internal combustion engine. It’s all coming together, slowly. In the meantime, I’m slogging through a project initiated by my friend Fiona Green, called Invisible Body. I say slogging because I’ve had to drag myself through it the way this person drags a cat who does not want to go for a walk on leash. Invisible Body will be a ten to fifteen minute performance during the Bathurst chapter of the Sydney Writers Festival. Three of us will read out pieces about our own bodies and perform things, on stage, physically in front of people. This is where the dread comes in. I’m happy to write, I’m happy to read things out, I’m happy to do bits and pieces on video that can be edited later but I’ve managed to avoid doing live theatre since about the age of 14, when I was a fairy in a pantomime put on in the Carnarvon Civic Cente. All memory of this performance has been lost without trace and even the building it happened in has long been demolished and replaced. That’s how much me and live theatre are not a thing. I’m doing this project out of an idea that it’ll be good for me and maybe for others (I’ll be talking about my illness and surgery, so it counts as an awareness activity). It’s good to stretch out of my comfort zone and participate in original theatre being created in my own town. That’s what I’m thinking. What I’m feeling is Reluctant Cat on Leash Being Dragged Across Floor. If I can just get on top of doing the skippety hops in time with the others (skippety skippety forwards, skippety skippety back) without losing it on the backwards skips, I might feel better about it. We’re giving two performances at the BMEC on May 22 and 23. Just looking through the pictures I’ve taken over the past couple of weeks. So much going on! 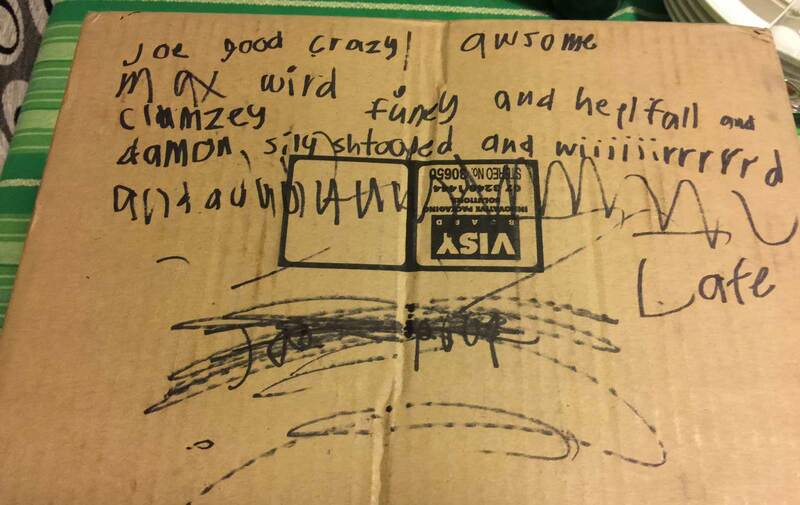 I particularly love this piece of creative non-fiction by Damon, young friend of my nephews, who was here for one night during the school hols. Pure Kerouac, I think. 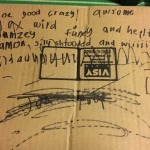 This entry was posted in Bathurst, Bathurst Community Climate Action Network, Carnarvon, friends, Hobbytex, Mt Panorama on April 20, 2015 by Tracy. 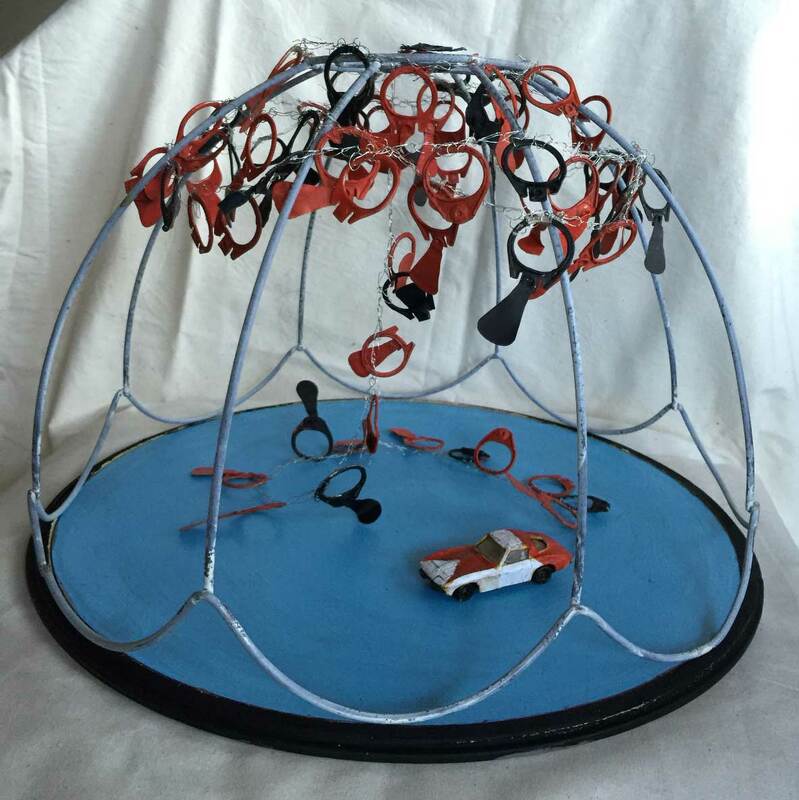 This is my entry for the 2013 Waste to Art exhibition here in Bathurst. It’s silly and the artwork itself is ugly. Anyway, it’s good to participate! 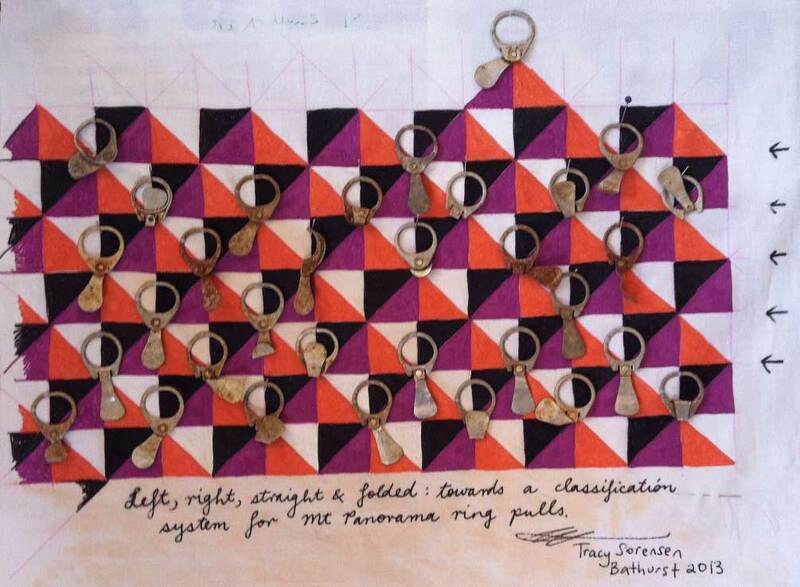 Title: Left, right, straight and folded: towards a classification system for Mt Panorama ring pulls, 2013. Media: Hobbytex and found ring pulls on old stained bed sheet, stapled to Peter Andren Independent foam core election poster in a damaged op-shop frame. My black Labrador, Bertie, loves to go for walks at McPhillamy Park on the top of Mount Panorama. I always keep my eye out for ring pulls to add to my collection. Like specks of gold in an alluvial landscape, Mt Panorama’s ring pulls shift and show themselves after a good rain. It’s always good pickings, then. Detachable ring pulls for drink cans were a phenomenon of the 1960s and 70s; by the 1980s, they had been discontinued because of concerns about litter and the way their sharp edges could hurt bare feet. Now, partly hidden in the dirt, they are nostalgic, suggestive objects. Their individual shapes are determined by the hands that originally tore them from the can. The unconscious movements of people – men, mostly – on top of a mountain, watching cars, getting drunk, are all captured in these objects. 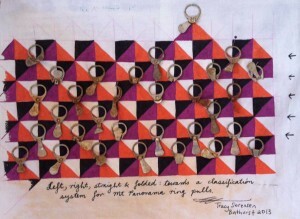 My grid pattern emphasizes how each ring pull “hangs”: the pivot-point sits at the apex of an orange and purple mountain; the tab swings to the left (purple) or to the right (orange) or follows the meeting-point of the two colours (straight). The retrieval and display of the ring pulls suggests the struggle to gather and contain past moments and give them meaning. The domestic impulse to tame and stitch down wild masculine moments is represented by the stained bed sheet. This domestic impulse has failed; the sheet is filthy and may need to be thrown out or used as a rag. The vivid Hobbytex colours celebrate the overwhelming, exuberant designs popular in the 1960s and 70s; the domestic art of painting with Hobbytex was itself a fad of those times. The bright colours, hand-painted, are also a reminder of a time when the car race itself was more colourful, heterogeneous, hand made, less blandly unified by corporate interests. Hobbytex, like the internal combustion engine, gives off powerful fumes. There is nothing non-toxic about Hobbytex paint. We no longer have dangerous detachable ring-pulls. Fume-ridden Hobbytex painting would never pass muster as a children’s hobby today. 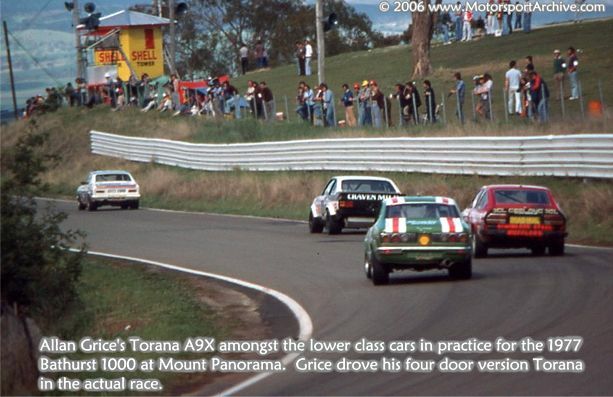 But the fossil-fuel burning internal combustion engine – a danger to the entire planet – is still celebrated every year at Mt Panorama. This entry was posted in Bathurst, Bathurst Community Climate Action Network, Bertie, Hobbytex, Mt Panorama and tagged Bathurst, Bertie, Mt Panorama, Waste to Art on May 2, 2013 by Tracy.